Ten Two Jack is Available Now! The weekend starts tomorrow and today’s a great day to prepare, right? What better way to spend the weekend than with a NEW Hunt for Jack Reacher novel? That’s right. Ten Two Jack is available now at all ebook retailers and in paperback! (Audio coming soon!) I can’t wait to hear what you think! Writing a new Hunt for Jack Reacher novel is always both fun and challenging. As you know, I always begin with a Lee Child source book. Many of you have asked how I choose the best source for the story I have in mind. The truth is that it depends on the story I’m planning. This time, I went right to Lee Child, the man himself, and asked him. Without hesitation, Lee’s suggestion was The Midnight Line. Because so many of you had read and loved The Midnight LIne, we both hope you’ll read and love Ten Two Jack as well. So now’s your chance! 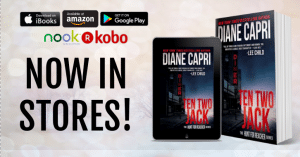 Ten Two Jack is available everywhere, including Walmart (thanks to our friends at Kobo) this time, too! I’ll have something really fun planned for you on that score, but for now, I can’t wait another minute to share Ten Two Jack with you! And please tell your friends and help us spread the word! Reacher set out to do a good deed for an Army officer in The Midnight Line. But the road to hell is paved with good intentions. And when Reacher’s enemies hunt his friends, someone has to pay. An exciting chase from Detroit to Chicago to Houston and deep into Mexico where FBI Special Agent Kim Otto fights to the death in the gripping finale. Buy the Audiobook: Audible coming soon!